The toilet seat question…when you are looking at homes online have you ever wondered why pictures of the toilet seat in bathrooms are up? If you need a reason besides common courtesy to put the toilet seat back down, look at the statistics, in all actuality we all should be putting both the toilet seat AND the toilet lid down, because flushing with the toilet lid up can cause germs from the toilet to spread into the air. Eww..
Jay Pil Choi has an answer to his own poll on this grave issue. he has estimated how many times we go a day, and factored in that men are only really slightly inconvenienced if it’s down. 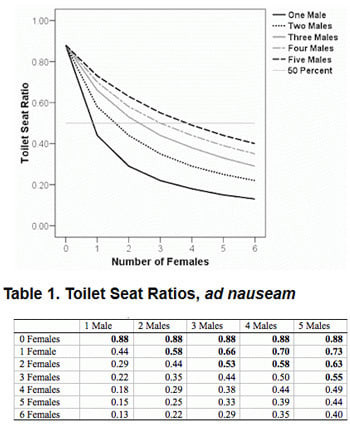 Using more thought than anyone in history has ever put into the “pee prep,” Choi came to the conclusion that if the number of women is greater than or equal to the number of men in the house, the seat stays down. -Realtor: I like most everything to be closed. Cabinets, showers, toilets. Also, I read somewhere that a toilet, when flushed, sprays a super-fine mist of toilet water on everything. I always flush with the lid down. So if I see the lid up, I feel like the whole bathroom is covered in toilet mist. Just my opinion, but I would keep the lid down. – Keep it Closed. You don’t want anything going in there, especially if dropped accidentally. And closed for pics always. That’s funny, You don’t want anything going in there. -Good point about things accidentally falling into the toilet. I still think it looks more “natural” to have the lid up though. I don’t think I have ever been in someones house where the toilet lid was closed. Natural? What do you think they made the lid for? -If you have a multi, have 1 with seat up and 1 with seat down whatever rents or sells the fastest is the winner. Sells faster now that’s a new one toilet talk… at it’s finest. -I would keep the lid up and the seat down. Bathrooms are a selling point in a home. Buyers want to see a clean toilet bowl without having to lift the lid themselves. Thoughts? Does the clean toilet really impact the sale of the house? I say maybe. – Definitely DOWN! I don’t like to see an open toilet. Tenants open the fridge, cabinets, etc., so if they want to open the toilet for a look, then they will. -I have had the misfortune to have to show homes where the owners thought it was fine and dandy to keep the lid open with urine in the toilet, so my vote is to have it down, if you really do need an answer. Yuk! So, we can all agree when its Yellow do not let it mellow. (I actually heard that from a client once…Ha). -I always take the safe approach and just remove the toilet completely. Now there’s a thought, I actually have seen clients do just that including the cupboards, flooring, doors and sinks. -Why does your toilet have a lid if you don’t put it down? -You want to make sure when someone says, “It’s a dump in there,” that they’re not referring to what they saw in the bathroom. So there you go. As a Realtor, I vote down. Cause you never know what could be lurking under the toilet lid. Kim Fank, Marketer, Coordinator and Team-Real Estate Broker in Helena, Montana. Educated in Commercial Arts and Marketing. Kim has a background in the Lithographic Industry. Kim has been a Real Estate agent since 2008. Kim enjoys working with Clients to provide them optimal client services. Kim and her Husband and partner in Real Estate have been working together as a team for years even prior to becoming Real Estate Agents. Kim and Keith owned and operated a franchised retail footwear company. They reside in Helena.